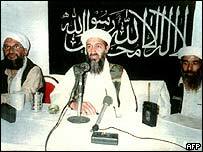 Al-Qaeda, meaning "the base", was created in 1989 as Soviet forces withdrew from Afghanistan and Osama Bin Laden and his colleagues began looking for new jihads. The organisation grew out of the network of Arab volunteers who had gone to Afghanistan in the 1980s to fight under the banner of Islam against Soviet Communism. The "Arab Afghans", as they became known, were battle-hardened and highly motivated. In the early 1990s Al-Qaeda operated in Sudan. After 1996 its headquarters and about a dozen training camps moved to Afghanistan, where Bin Laden forged a close relationship with the Taleban. The US campaign in Afghanistan starting in late 2001 dispersed the organisation and drove it underground as its personnel were attacked and its bases and training camps destroyed. The organisation is thought to operate in 40 to 50 countries, not only in the Middle East and Asia but in North America and Europe. In western Europe there have been known or suspected cells in London, Hamburg, Milan and Madrid. These have been important centres for recruitment, fundraising and planning operations. For training, the group favours lawless areas where it can operate freely and in secret. These are believed to have included Somalia, Yemen and Chechnya, as well as mountainous areas of Afghanistan. There have been reports of a secret training camp on one of the islands of Indonesia. Unlike the tightly-knit groups of the past, such as the Red Brigades in Italy or the Abu Nidal group in the Middle East, al-Qaeda is loosely knit. It operates across continents as a chain of interlocking networks. Individual groups or cells appear to have a high degree of autonomy, raising their own money, often through petty crime, and making contact with other groups only when necessary. This loose connection between groups has raised a question of definition. When we talk about al-Qaeda do we refer to an actual organisation or are we now talking about something closer to an idea? Attacks like the May 2003 bombings in Riyadh and the attack on Israeli tourists in Mombasa in 2002 are widely attributed to al-Qaeda. But were these attacks in any way planned or financed or organised by Bin Laden or the organisation he is still believed to lead? Some analysts have suggested that the word al-Qaeda is now used to refer to a variety of groups connected by little more than shared aims, ideals and methods. We do however know that several radical groups are or have been formally affiliated with al-Qaeda. The most important is the radical wing of the Egyptian group Islamic Jihad whose members took refuge in Afghanistan and merged with al-Qaeda. Its leader is Ayman al-Zawahri, a ruthless Egyptian believed to be the brains behind al-Qaeda and the mastermind of many of its most infamous operations. These include the attacks on two US embassies in Africa in 1998 and the 11 September attacks against New York and Washington. The GIA, or Armed Islamic Group, in Algeria and its radical offshoot known as the Salafist group, or GSPC. Western police forces and intelligence agencies have had some successes in breaking up al-Qaeda cells, closing down front companies and freezing assets as part of the "war on terror". Some of its top leaders have been killed or captured, and interrogations of some members at Guantanamo Bay have further weakened the organisation. However, uprooting the organisation in its entirety has been a highly complex and frustrating task. In a recent report on Iraq and the war on terror, the Oxford Research Group noted that despite the detention of many of its members, al-Qaeda "remains vibrant and effective". Most frustratingly, the fate and whereabouts of Osama Bin Laden himself is still a deep mystery.